A relative of sorts of the tuna and mackerel, the bonito is a predatory fish that is also commonly known as the Sardini. 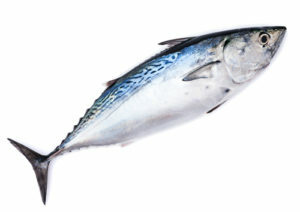 Interestingly, the word ‘bonito’ is a commonly used adjective in Spanish which translates to “pretty” or “beautiful”. Even with its potentially Hispanic origins, the name of the bonito is believed to have been derived from the Italian word “buono”, which translates to “good” or “bonus”. The name could also be a tribute to the supposedly rich taste of the medium-sized fish. Despite have a fairly unassuming name, the bonito has developed a reputation for striking hard and it will challenge even the mightiest of anglers. Even with that in mind, the fish will latch onto virtually any bait you decide to use. The bonito is one of the many different types of fish you can find in the cerulean waters of South Florida. If you feel up to the challenge of taking on this tuna-like fish, just give us a call to book your trip.